Do Not Disturb! 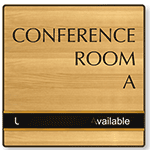 Our professionally engraved Select-a-Color signs are ready for quick shipping. • This Do Not Disturb Sign has either white or black letters on a contrasting background. Select your color below. • Edges of sign have a distinctive beveling, while Optima font adds a professional touch to your sign. • Foam adhesive strips are included with your order; other sign attachment options include hook and loop fastener, magnetic strips or mounting holes and screws. • Order other legends at the same time and save money on your sign order.